Why styli? Well, I have done away with paper and pen as mentioned in my previous post, partly because I hate to be wasteful and because of the convenience of being able to search keywords to look up my notes. But occasionally, I do have to sketch or make notes on PDF files, so I found it a little bit inconvenient without a writing tool. That is how I ended up with my Pencil FiftyThree. I love my Pencil (obviously because it was a gift! ), but to me, I prefer a hard-tipped stylus because it feels more natural to write compared to a soft-tipped / capacitive stylus. While The Pencil did a good job taking down notes in GoodNotes apps, the wide rubbery tip did not give me the 'satisfaction' of writing. It's probably a better tool to sketch a drawing and do a lot of cool drawing stuffs since it is designed for Paper apps. That is why I ended up buying Adonit Snap. 1. 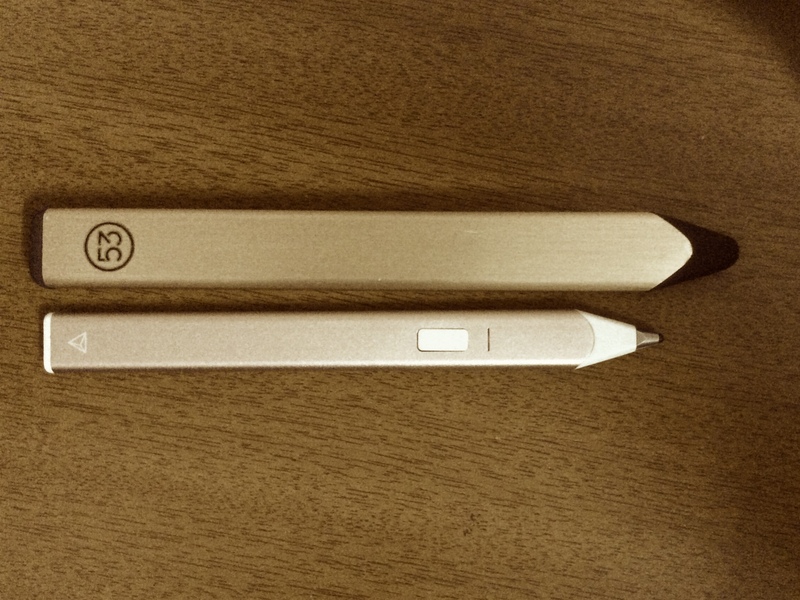 It has a nice design, flat like The Pencil. 2. Its body is magnetic and it comes with a small magnet plate that you attach to your smartphone, and you will never lose it. So convenient to bring anywhere and not fear of losing it. 3. When not use for writing, it can double up as a selfie button when connected to a smartphone's bluetooth. Cool, right? 4. It is cheaper than Adonit Pixel (my dream stylus) by a few hundreds. 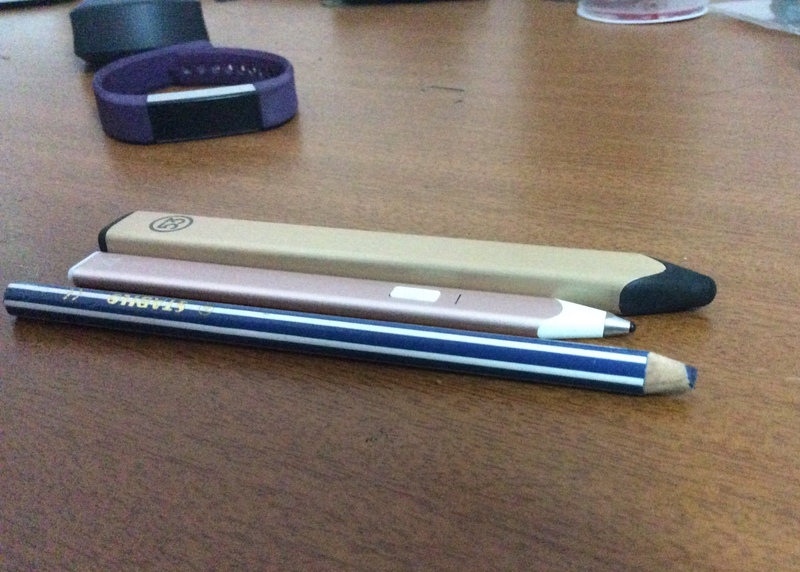 Adonit Snap next to Pencil FiftyThree. Snap is smaller and shorter. Not only Snap is smaller, it is also thinner but still comfortable to hold. The Pencil, Snap and a real pencil for comparison. Both are written using the same setting i.e. fountain pen and second finest line on preset. Notice the difference in the thickness of the handwriting. 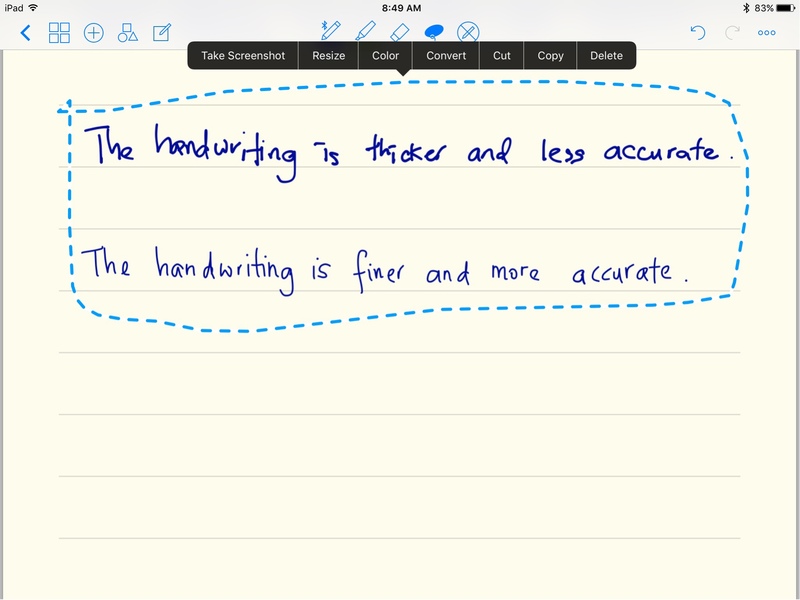 The good thing about The Pencil is it is compatible with most note-taking apps such as GoodNotes. It even connects with the apps to deliver a more superior experience, such as palm rejection and better accuracy. I guess this would have been a fairer review if I had used Adonit Jot or Pixel to compare against The Pencil. But that's not the purpose of this review. 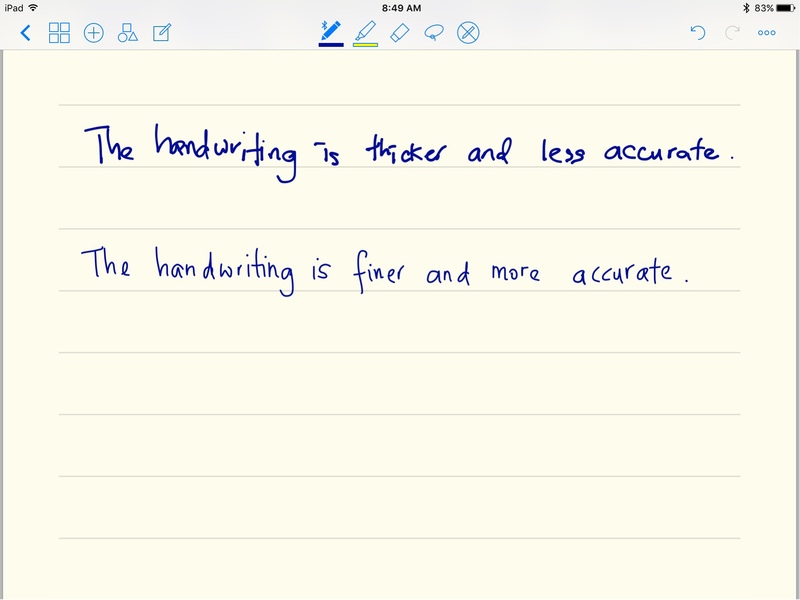 It is simply to see how well is Snap's performance when taking notes using GoodNotes. The Pencil works wondrously when 'kissed' with the apps. As I mentioned before, Snap is not designed to work with iPad. It is simply not a tool for work, but more for fun. Therefore, it doesn't require any connection to link it to GoodNotes, and to write with this stylus, simply choose Smart Stylus > None. Both handwriting is legitimate, but writing with Snap requires some getting used to since it is less accurate. The trick with writing with Snap is to practice for a while until you get the hang of it. By getting the hang of it, I mean knowing the angle of holding the stylus so the apps can detect it and knowing how to space between each letter. If you write like you are using The Pencil, the handwriting may end up too close to each other or even piling up on each other (what a description, LOL!). So, this is the best part about GoodNotes apps. 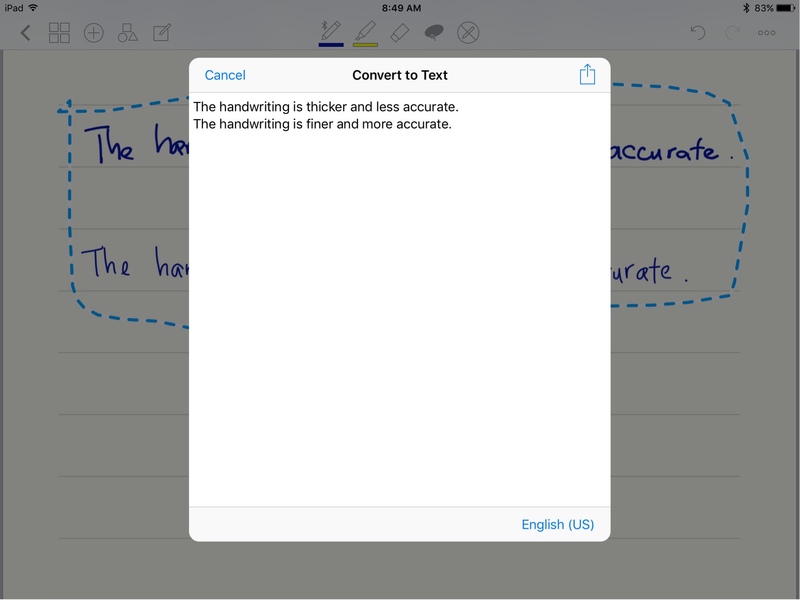 After writing down my notes, I can select the words and then convert them to text. I then simply transfer my notes to OneNote where I keep all my work notes. As you can see below, both handwriting are perfectly legible and when converted to text, it is 100% accurate. 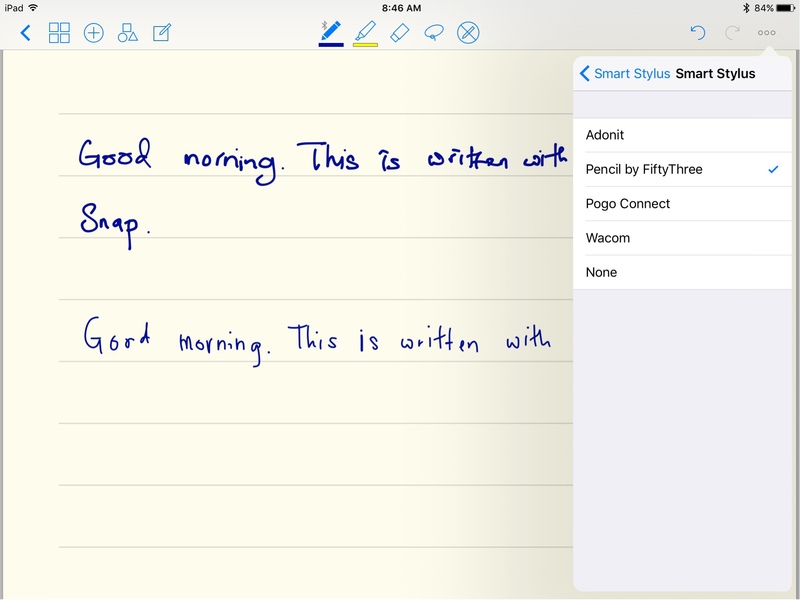 My conclusion is that Adonit Snap can be used to take notes using iPad. Although it is not designed for note-taking apps, it can deliver as long as you don't put too much expectation as you would on other premium smart stylus like Pencil FiftyThree. If you are, then you will be greatly disappointed with its performance. I only wish that Adonit would design a stylus that has the feel and look of Adonit Snap but with all the features of Adonit Pixel (the 1.9mm tip is a good start). If they do, I would probably be among the first in line to purchase that stylus.